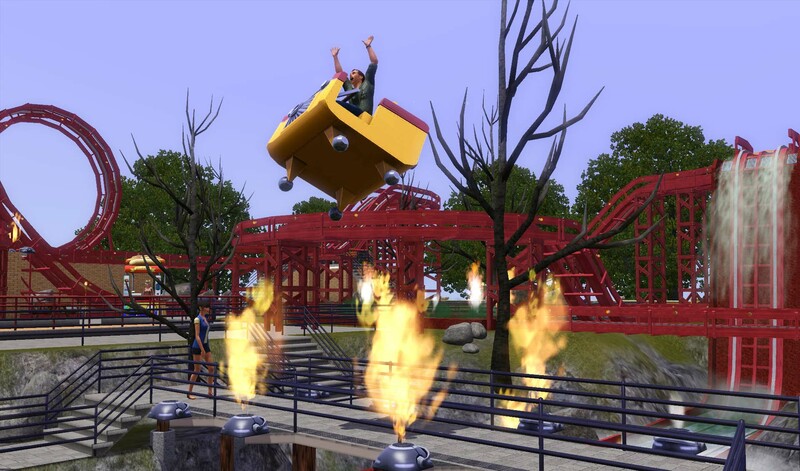 Don't let flames and a whiff of sulfur keep your sims from enjoying The Devil's Playground. This amusement park features a dramatic roller coaster which jumps right over the primary entrance path. 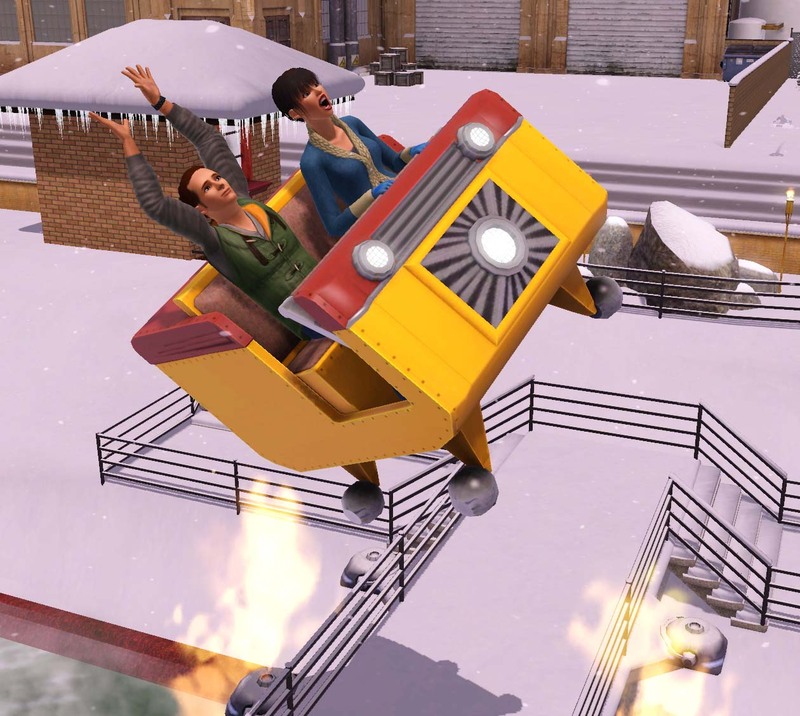 Most sims are easily spooked by few fireballs and prefer to take a longer route. Wimps. 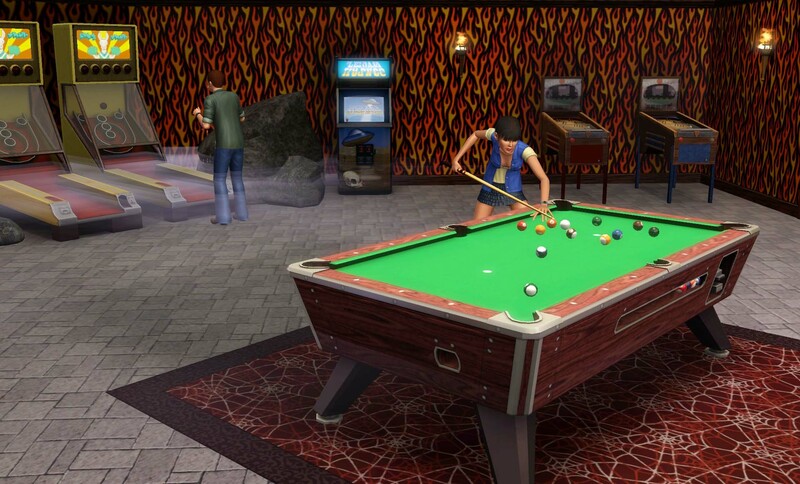 Additional temptations to corrupt innocent teen sims are found in the arcade, while their parents can enjoy music or a show on the main stage. Although set up with musical instruments, the stage is large enough for other types of performances. In spring and summer there's a roller skating rink under the framework. 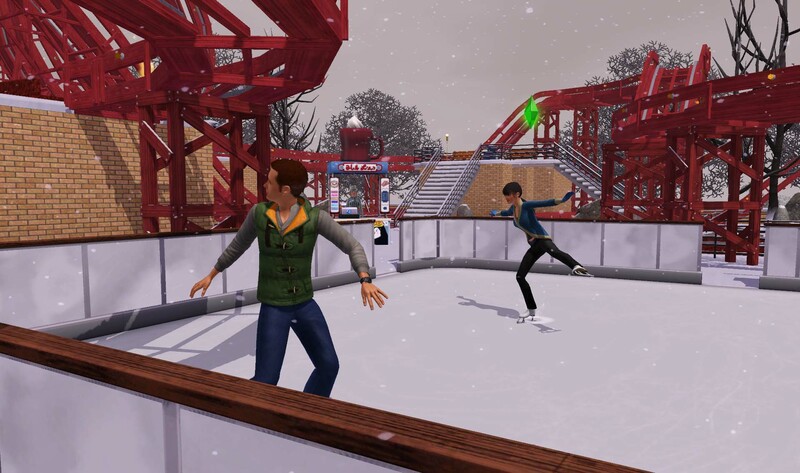 And when this place really does freeze over, an ice rink takes its place. A few other facilities change with the seasons, but this is not a true festival lot. 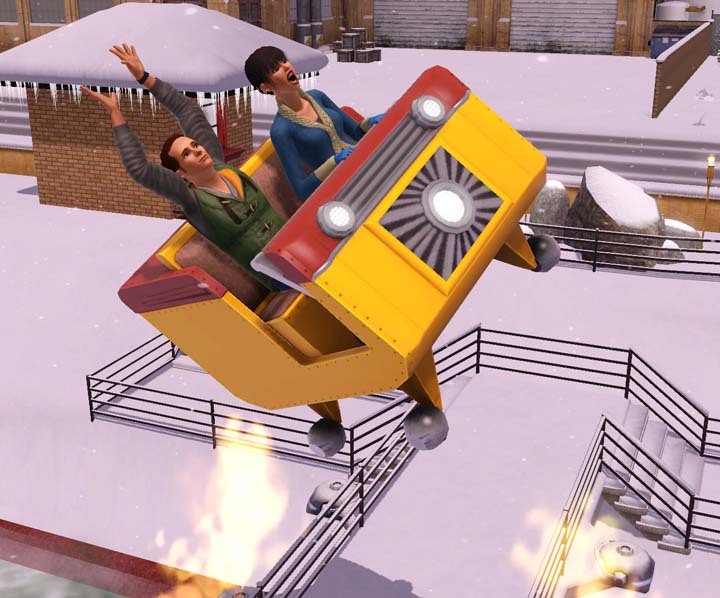 I think one of these sims enjoys roller coasters more than the other. 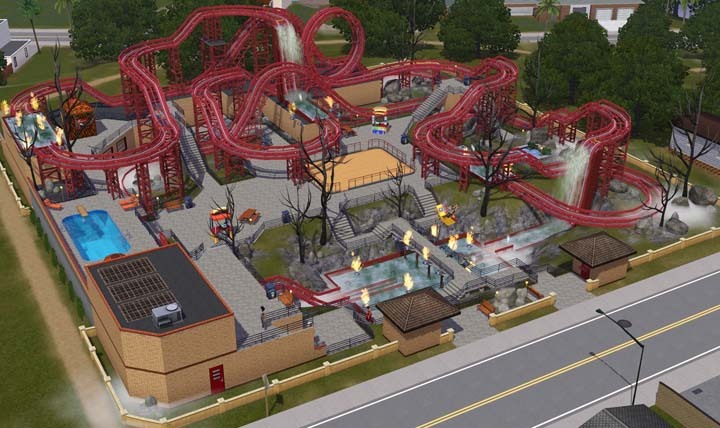 If you would like to add this amusement park to your world, feel free to download it below. Requires a 60x60 lot, not 64x64, so it should fit into more worlds. No CC, but requires most EP's except Supernatural, plus many Stuff Packs. The roller coaster from the Roaring Heights store world is required. The Showtime EP is required for its EFX machines and stage props. The Seasons EP is needed for the festival facilities. Caution! Save your game before adding the lot. When placing it, your game may occasionally freeze up. Just restart the game, try again and it should work. The Devil's Playground is a large complex lot so even when it is added correctly, you'll see the game's "Processing..." message for twice as long as it would with most other lots. While in Edit Town mode, select a 60x60 lot and change it to the community "Visitors Allowed" lot type. Under the Community Lots tab, select the Devil's Playground amusement park and place it on your lot. After adding the lot, the first time you save your game it will take a bit longer too. But subsequent saves should be back to normal. When your sim first visits the lot, since they are on the ground level you won't see the upper parts of the roller coaster. Click the "Go Up A Level" button a few times to show it all. If you are zoomed all the way back to get an overview of the lot, some of the most distant flames will not be visible. Zoom in a bit closer to get the full effect. If you want to edit the lot, remember that it has a Seasons hidden marker near the front-right corner. Be sure to follow the proper process for changing Seasons-type lots (official info here).